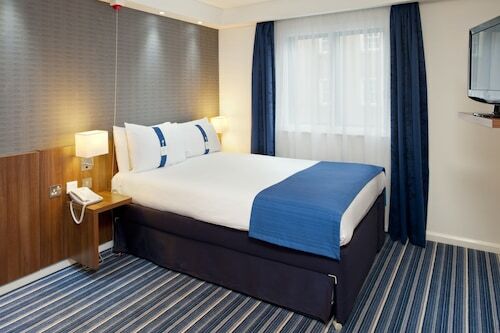 With a stay at Holiday Inn Express London City in London (London City Centre), you'll be within a 10-minute drive of Museum of London and London Stock Exchange. This hotel is 1.7 mi (2.7 km) from Sky Garden and 1.7 mi (2.7 km) from St. Paul's Cathedral. Wrap up your day with a drink at the bar/lounge. A complimentary continental breakfast is served on weekdays from 6:30 AM to 10 AM and on weekends from 7 AM to 10:30 AM. Wrap up your day with a drink at the bar/lounge. A complimentary continental breakfast is served on weekdays from 6:30 AM to 10 AM and on weekends from 7 AM to 10:30 AM.Pets not allowed Check-in time starts at 2 PM Check-out time is 11 AMFeatured amenities include dry cleaning/laundry services, a 24-hour front desk, and multilingual staff. Self parking (subject to charges) is available onsite.Extra-person charges may apply and vary depending on property policy.